I’ve already talked pretty extensively about ties and pocket squares in my Men’s Essential Accessories series, so if you haven’t sen those articles/videos and don’t know the size of ties you should be wearing or the best ways to fold your pocket squares, check them out. 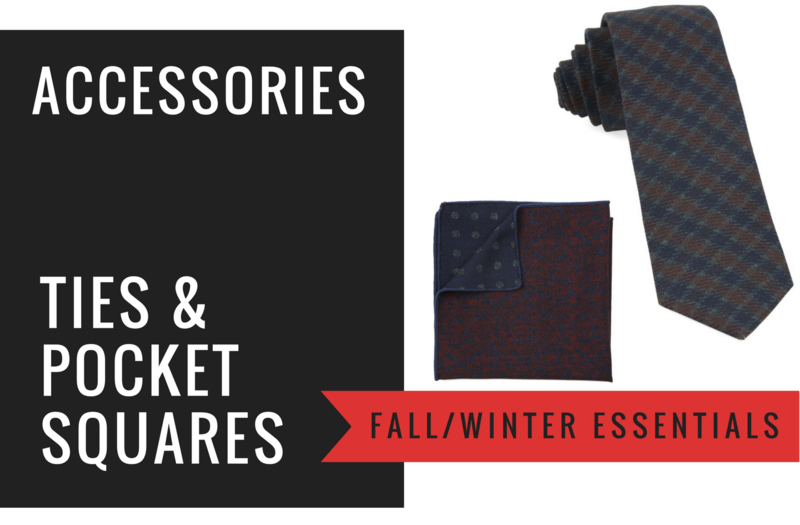 The wool ties & pocket squares I’ll be discussing below are essential for the Fall and Winter seasons because they will compliment the items in your Fall/Winter Wardrobe nicely. For your ties and pocket squares during this season, you need to go all in with wool. There’s also technically cashmere, but there’s not a lot of them being made and I find them to be obscenely expensive when a wool tie looks just as good. The reason you go all in on wool is because you want your accessories to compliment the fabric weights of the items you’ll be wearing during the various seasons, so if you were wearing silk or linen ties, which are for Spring and Summer, with your heavier wool suits or sport coats, it would look really off. As far as patterns, it’s also the best time of year to wear plaids, paisleys and polka dots because they’re visually heavy and pair so well with your Fall and Winter wardrobe. The one area that I see men really have an issue, though, is with matching these patterns and colors together with their outfits or other accessories. And the inverse is true for a patterned pocket square – go for a solid or very subtle patterned tie. This helps balance these items out so you don’t look like a goofball. The ties from Tom Ford, Alexander Olch, and Thom Sweeney are pricey, but you’re paying for a high quality, luxurious accessory that’s timeless. If you’re going to shell out this amount of money for a tie, then you want to make sure it’s easy to wear and it’ll never go out of style. For fun patterned ties that are also easy on the wallet, I’m a huge fan of The Tie Bar (and no, they’re not paying me to say this). For great textured wool ties in solid colors, I love J.Crew. They also made a charcoal chalk stripe tie that is really easy to wear with your existing wardrobe. Brunello Cucinelli makes probably the best – in terms of color, pattern, and quality – pocket squares out there, in my opinion. The Hugo Boss and Alexander Olch pocket square and rounds are all the perfect shade of grey so they’ll pop really nicely from your darker suits or sportcoats. The striped J.Crew pocket square will go with pretty much every Fall suit/sportcoat you have. For some great patterened options at an incredible price point, I love the double sided ones by The Tie Bar.